From April 22nd through April 24th the Ubuntu Classroom team worked with teams across the Ubuntu community to bring together 12 sessions exploring various parts of our community, from Documentation to Core Apps to the Kernel team to present Ubuntu Open Week. Thanks again to everyone who participated in this event, from presenters who lead sessions to attendees who came with their curiosity and questions! Ubuntu Open Week for Trusty: Starting Soon! And the Ubuntu Open Week for this cycle is just around the corner! This will be three days full of excitement, where you will be able to know what different teams and people in the community do. Whether you are a developer, a designer, a tester or a community member, this is the right event if you want to get involved with the community and are looking for a starting point. The event will take place from April 22nd to April 24th 2014, from 15 to 19 UTC each day. During these three days we will have people from various teams, such as the Server, Documentation, and Juju teams. There are twelve different sessions scheduled, so make sure to find which ones interest you and write the times down in your calendars! The full schedule can be found at the Open Week Wiki page. All sessions will take place at #ubuntu-classroom and #ubuntu-classroom-chat on irc.freenode.net (click here to join from your web browser). There are three sessions in the schedule which are labeled with the [ON AIR!] tag, which means the session will be streamed live at the Ubuntu on Air! webpage. In the case you can not attend the event, logs will be linked in the schedule as soon as they become available. For On Air! sessions, they will be available at the Ubuntu on Air! YouTube Channel. Hope to see you all there! So it’s this time of the year again! As the end of the current cycle approaches, the Ubuntu Classroom Team is starting the planning of the next Ubuntu Open Week, for the Trusty cycle. The Ubuntu Open Week is a series of classroom sessions which will guide many people in their way for contributing to the Ubuntu community. For this, we need actual Ubuntu contributors from different teams to help us run one-hour sessions, explaning what you do on the team you currently work on, as well as how to get started working on the team. We have three days with 5 one-hour slots each, making it 15 slots in total. The event is scheduled to run from 15 to 20 UTC, from the 22nd to the 24th April. If you are interested in running a session, please send an email to myself (jose at ubuntu.com), ubuntu-classroom at lists.ubuntu.com, or let us know on IRC at the #ubuntu-classroom-backstage channel on irc.freenode.net. Logs from out past Open Week can be found here. Please, make sure to give the link to this announcement to anyone who may be interested in running a session. Thank you for your interest! 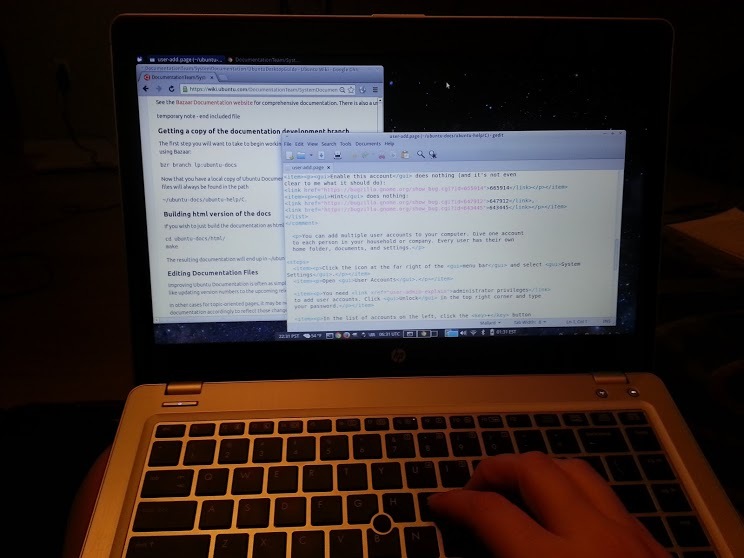 Interested in getting involved with documentation for Ubuntu, but not sure where to begin? This weekend the Ubuntu Documentation and Ubuntu Manual teams got together to offer 5.5 hours of documentation-related sessions in Ubuntu Classroom. Also thanks to classroom helper Jose Antonio Rey who was available to help instructors throughout this event. Reminder: Documentation Day in the Classroom is just a week away! Interested in getting involved with Ubuntu Documentation, but not sure were to begin? On Sunday, March 2nd, the Ubuntu Classroom team is hosting a day of Documentation-related chat (IRC) sessions to get new contributors ready to participate. Sessions all take place on Internet Relay Chat (IRC). If you want to participate, you just need to join #ubuntu-classroom and #ubuntu-classroom-chat on irc.freenode.net in your IRC client, or just click here for browser-based webchat. The instructor will give the class in #ubuntu-classroom and attendees can chat about the class and ask questions in #ubuntu-classroom-chat. If you’re unable to attend, logs of each session will be made available following the event. We hope to see you on Sunday, March 2nd! March 2nd is Ubuntu Documentation Day in the Classroom! The Ubuntu Classroom team is happy to announce that we’ve teamed up with the Documentation and Manual teams to offer a day of Documentation-related Classroom sessions on Sunday, March 2nd. The day will start off at 16:00 UTC with a session by Elizabeth Krumbach Joseph (pleia2) consisting of a quick tour of all the Documentation resources available, including Desktop, Server, Wiki and Manual. The next five sessions will give potential contributors an overview of contributing to each of the resources (all times UTC, click on time for link to time conversions. So come learn how to contribute to documentation with us! 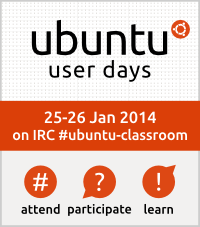 On January 25-26th 2014 we hosted Ubuntu User Days in the Ubuntu Classroom. We are very thankful to our instructors and attendees who made the work of these last weeks worthwhile, we feel very proud of all of them. Congratulations!